This is hard for me to say, but I’m sharing it anyway because it’s the real reason I’m creating a tickler file system for greeting cards. I recently had someone close to our family tell me my children are rude because they never send thank-you notes. Ouch. Ouch. You know why that hurts so much? First, it’s true. (Well, it’s partially true. They are not rude children on the whole, but it’s true about their failure to send cards.) And second, it’s my fault. They are young, and as their mother I have not set a good example nor have I insisted this is something they must do. I generally have encouraged them to thank the giver in person. Growing up in my family, that was always enough, but as an adult I realize this isn’t the norm for everyone. My problem goes beyond thank-you notes, though. I have a sweet friend who should own stock in Hallmark because she is truly the greeting card queen. She loves choosing cards and sending them, and she enjoys writing and mailing notes to people. I am not her. That’s just not my thing! While I think it’s OK that this isn’t my strong suit, I really do believe that my close family and dear friends deserve to receive lovely cards and notes on occasion. Plus, I know my family and I have fallen off peoples’ lists because of our failure to reciprocate. I don’t like admitting these shortcomings, but the truth just plain hurts sometimes. I can either get upset and beat myself up, or I can learn from these experiences. I’m trying to learn and let all of this fuel me for change. Rather than just wanting or wishing to do better, I spent some time thinking about what stops me from sending cards. Why don’t I send prompt thank-you notes or honor people with birthday cards? I brainstormed my obstacles and looked for solutions. My mail and greeting card supplies are too far removed. It’s all stored in a closet off our office space in the basement. That is a smart place for office supplies, but it’s too far out of the way of everyday life. Solution #1: Create a greeting card mini-zone near the hub of family activity so it’s easier to get the job done. 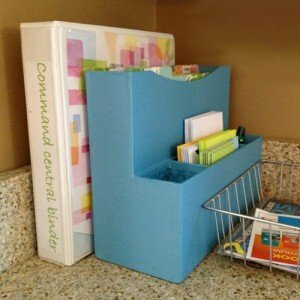 I picked up a desk organizer with holders for files, pens, stamps, and miscellaneous cards and envelopes. While a traditional tickler file has a folder for each day of the month, I simplified mine and have one folder for each week of the month. It fits next to my Command Central Binder on our kitchen counter, right in the hub of family life. Before now, I have not had a comprehensive list of close friends’ and family members’ birthdays and anniversaries. Instead, I’ve got some memorized, some popping up as Facebook notifications, and some saved in my online calendar. Solution #2: Create one master list of family members’ and close friends’ birthdays, special days and anniversaries. My list includes mailing addresses so that everything is organized right where I need it. I’d love to find an app that helps me with this, but for starters a printed spreadsheet will do! There’s actually a great pocket on the back of my tickler file to hold this document. I tend to remember birthdays on the actual date, which does me no good when it comes to snail-mailing a card. Solution #4: Shop for cards in advance. I’m stocked with thank-you notes and blank cards, plus a few “congratulations” and “thinking of you” cards. Unlike birthdays and anniversaries, there’s not always advance notice for needing those types of cards. In my Week Three file folder, I have a reminder note to shop for the next month’s cards. With my master list in hand, I will buy greeting cards a month in advance. Once I fill them out and drop them into the appropriate folder, I simply drop them into the mail at the beginning of each week. I have some sort of disconnect about shipping packages. Honestly, I don’t know what this is, but the process of getting a gift packaged, addressed, and to the post office is more than I can seem to manage. For example, last summer I had a package to send my Dad that sat in the shipping envelope until I finally hand-delivered it to him at Christmas. Good grief! Solution #5: Opt for gift cards rather than trying to mail a package. As long as I’m being honest, let me just say this isn’t likely to change, so I’m letting myself off the hook. No more packages. It may be less personal, but a gift card that the recipient actually receives is far better than the loveliest of gifts that sits on my desk until it’s 5 months belated! And if I simply must send a package for some reason, I will enlist the help of my dear husband who is wonderful about actually getting this done. If you have obstacles that prevent you from being great with greeting cards, leave me a comment. Also, does anyone know of a great app for tracking birthdays and special dates and also integrates contact information? I’d love to hear what works for you! sending cards to many people for many reasons and my system functions well for me. (I have a small book where I record birthdays and other times to send cards and generally have cards on hand. I even buy them by the box as well as individual ones. Stamps and address labels are handy in my desk drawer, but I have not yet set up a tickler file.If I did that I could sort out cards by week for at least a month. I think I will try setting one up in the near future. Thank you for the idea. Thanks for your comment, Debbi, and for sharing what works for you. I love hearing other people’s solutions. One question I have for you is what prompts you to refer to your book? I am just curious if you look at it on a certain day of the week or each day. Oh, I completely share your aversion to sending out packages. I hate packing things up, and I hate making the trip to UPS or the post office. This is great inspiration to be one of those people who send out cards all the time. I think it’s so nice to send birthday and other cards–I know I’ve always admired people who do that. Nancy, should we start a support group for people who can’t send packages? LOL Thanks for sharing! Love the idea of cards for the month. I’m bad about not having one and having to run and grab one quick. I use the Occasions app. It lists all birthday by month and each person has all the info from my contacts so the address is right here. Thanks for all the great ideas. Kat, I will definitely look into that app. Thanks so much for the suggestion! Great idea with the Tickler system. I have my own version of this too. I have all important dates in my Iphone calendar (my only calendar) and have each even to alert me one week in advance. I can then mail out the cards on time with no worry. Like you, I shop in advance for birthday/anniversary cards, and keep thank you notes and Amex gift cards on hand. This way the recipient can purchase something they need (and I am assured it won’t be “re gifted” – smile. Amex gift cards on hand? Great idea! Thanks, Linda. Amy, true confession time… one of the cards in the above photo is for my nephew’s 16th birthday, but I misplaced it before his birthday rolled around. He is turning 22 this week. LOL If you try a tickler file, I’d love to hear how it works for you! Amy, I did this big time one year. My husband and I were moving from Florida to Colorado in November. He comes into my office and throws an envelope on my desk and asks “What is this?” I looked at it and it was obviously a greeting card. The envelope has our return address on it, it also had a stamp on it AND it was addressed to his son!!! I had no idea what it was. I opened the envelope and OMG!! It was a Christmas Card to his son and daughter-in-law with $100 in it. I was in deep trouble believe me! Somehow, it was ready to go and I just failed to mail it. Luckily, don’t do that anymore. In answer to your question, I look at my birthday book at the beginning of each month, list the cards that I don’t already have so I can buy them.. I put the date (could be anniversary etc. also) in pencil in the date in stamp corner of the envelope so I know when to mail it. Years ago I would get cards and lose them too, Then I made a ring-binder with 12 pocket dividers. I would then put the card in the appropriate month’s divider. This has worked for me for about 20 years. However, I am thinking a tickler file of 4 weeks might be of help as I now send many more cards. 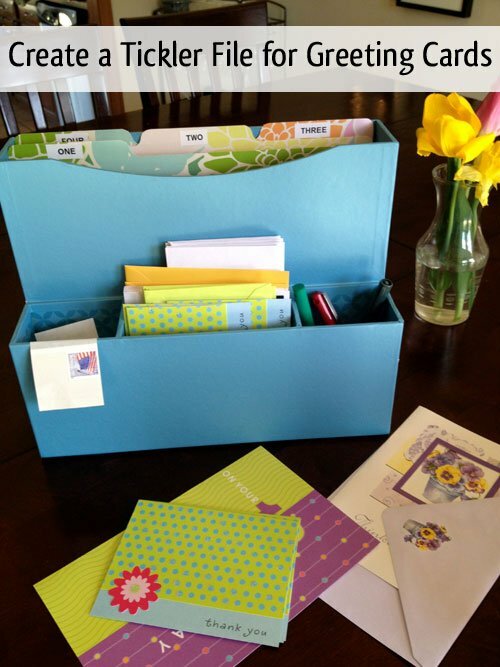 Wow, Debbi, great system to organize greeting cards! Thanks so much for sharing! Every Christmas, my aunt puts together a photo calendar with everyone’s birthday and anniversary on it. I enjoy looking at the calendar and am reminded often when it is time to send a card. This will work well with the tickler file. Jennifer, what a great gift your aunt gives. I agree – that’s a great complement to a greeting card tickler file! For years I have used Birthday Calendars. Instead of a regular calendar, these are 12 months of long, narrow lists, each with a line next to a date, and a pretty picture at the top. I write in the name of the person on the date line, and a little note or symbol for the event. I use a heart for anniversaries. The best thing is that I don’t have to fill out dates on the calendar every year, since it is perpetual. It hangs in the family room, and I change the page a few days before the end of every month. I keep a box of pre-purchased cards, sorted by type. Anniversary, Birthday, Get well, etc. A DVD box with dividers woks great for me. When I turn the calendar page, I sign and address all the cards for the month, and write the mailing date (3-5 days ahead of the actual event) where the stamp will go. I keep them where I will see them for mailing. When the mailing date arrives put the stamp over the mailing date on the envelope, and drop them in the mail so they get there in time. Works for me. I came up with the idea to create a Tickler file for birthdays (thank you author David Allen for introducing me to the term Tickler File) and googled to see ideas of birthday files. Thank you for your post! Some extra ideas I hadn’t thought of. I’m just doing a file for each month, and I wanted to comment to tell you about the “app” I use. It’s called Birthday Alarm, I think they have an app now but I have been using their website version for years. I have all of my close family and friends emails entered, and it emails me a week before, then two days before their birthdays. Now that I have the tickler file set up, the week ahead email notice should be the one I use, but if for some reason I am held up, the two day notice is a good reminder to send an email. Like you mentioned, a heart felt email on time is better than a card months late … Or never! Just wanted to pass on the resource of BirthdayAlarm.com though. Thanks again for your post! 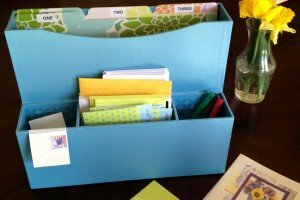 I realize this post is three years old, but where did you get that great desktop organizer?